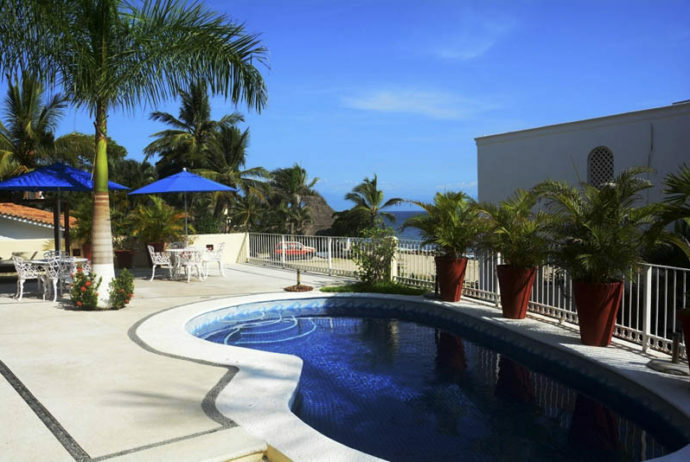 Beautiful Mexican style property featuring 2 houses surrounded by flowers, located just a few steps from the beach in a gated community with 24/7 security and cobblestoned streets. Casa Mar de Grecia is the perfect place for a romantic escape or a family trip. In this property you will find 2 homes each with 3 bedrooms, 3 full bathrooms, fully equipped kitchen, living and dining area, covered garage, spacious terrace area with pool and ocean view. Bedroom # 1, King Size bed with, satellite local T.V., nice balcony, one Sofa, two lounge chairs, full bathroom and closet. Bedroom # 2, King Size bed with, Satellite local T.V., full bathroom and closet. Bedroom # 3, Two single beds, satellite local T.V. and closet. If you like water sports like surfing, kayak, paddle surf and swimming, this is the place. It is located about 8 minutes driving to Punta de Mita, 25 minutes driving to Sayulita, one of the most recognized surfing areas; Bucerias is 20 minutes away and the Puerto Vallarta airport just 35 minutes driving.